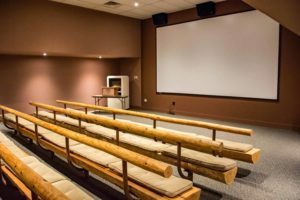 The Bennett History Museum’s Theater shows an award-winning film, "The Southeastern Indians," which gives visitors a new understanding of the history of the native people who settled northwestern Georgia. The film was co-produced by the Georgia Department of Natural Resources' Film and Video Division and Reinhardt University. The 15-minute documentary with a cast of 13 Native American actors tells a story that is as compelling as it is tragic. You will also see the magnificent landscape of Georgia from the rivers to the mountains. The film helps visitors appreciate Georgia's natural environment and the role it played in the history of this region. The theater features a giant 9 foot high by 16 foot wide screen and impressive Dolby surround sound. Tuesday-Friday: 9 a.m. - 4 p.m.
Sunday: 1p.m. - 5 p.m.